Surrealism is not for everybody. This art movement’s alternative – some might say warped – view of reality can be unsettling. But many art fans find surrealism intriguing and mentally stimulating. As we know, art is in the eye of the beholder. Here’s a little background on surrealism to help you decide whether it’s a good fit for your mantel. Les visiteurs du Dimanche by Max Ernst, 1924. Instead of painting traditional portraits or landscapes, the surrealists let their imaginations roam free. They tried to capture images from their dreams and unconscious. 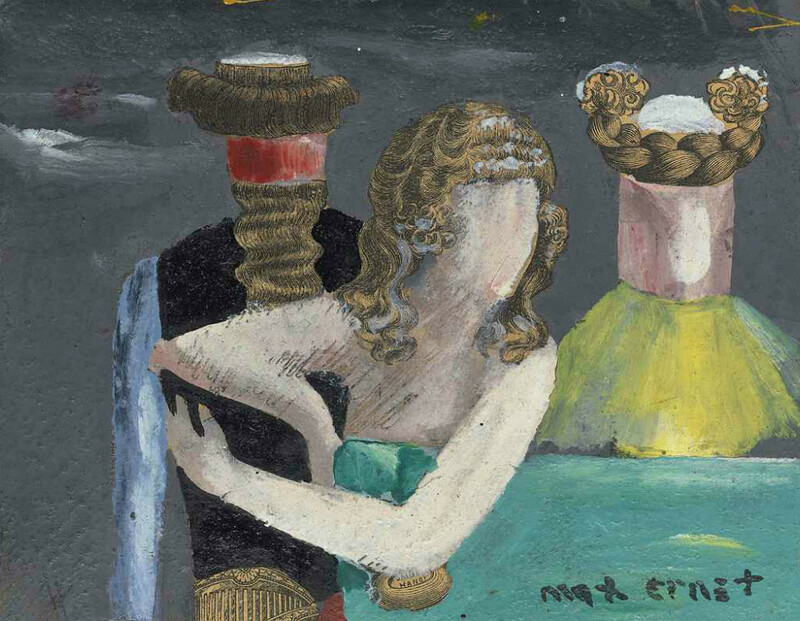 Leading surrealist André Breton described the movement’s aim as to “resolve the previously contradictory conditions of dream and reality.” He urged artists to bypass reason and connect with their unconscious minds. Surrealist art is easy to recognize because of its unreal qualities. Some of the most famous works show melting clocks, an ordinary man with an apple obscuring his face and dreamy landscapes with unexpected elements. Surrealism began in France after World War I. In the 1920s, Breton wrote two Surrealist Manifestos in which he theorized about the movement. He and his contemporary surrealists wanted more free thought, individualism, and self-expression. In addition to visual art, musicians and writers also borrowed from surrealism. The surrealists drew from a strange mix of inspirations, including the imagination of Romanticism, the revolutionary ideas of Karl Marx and The Interpretation of Dreams, a book by Sigmund Freud published in 1899. Surrealism was partly a backlash against World War One, which some artists believed was caused by excessive materialistic values. Artists continue to use surrealist elements in their work, but the movement’s heyday was the 1920s and 1930s. Giorgio de Chirico might have been the first surrealist painter, going back as early as 1917. His hallucinatory paintings predated Breton’s theorizing. In 1922, the German artist Max Ernst moved Paris, where he became an important part of the surrealist movement. Painters Joan Miró and André Masson were also important early surrealists. To this day, Spanish painter Salvador Dalí is surrealism’s most famous painter. He was also Sigmund Freud’s favorite. Dali’s realistic rendering of totally unrealistic subject matter has drawn many fans, and his work is still widely reproduced. Mexican painter Frida Kahlo is often called a surrealist, and Breton himself claimed her as part of the movement. However, Kahlo rejected the label. So, which of our mantels best lend themselves to surrealist works? It depends on the painting or print, of course. The curves and flourishes of our Calais or Carved Brentwood go well with softer, dreamier surrealist paintings. Or with a minimalist mantel like the Manhattan, you can go as complex and angular as you want in your art choices. Our Calais lends itself to more romantic surrealist paintings. Art is a very individual, personal preference. But if you’re unsure of the right mantel for you, we’d be happy to help. Give us a call today.